Some day, maybe 100 years from now, all of the top consumer tech companies will use the same standards. All devices will be compatible, whether they’re made my Apple, Samsung, Google, or any other company. OK fine, so maybe it’s a pipe dream. Believe it or not, however, there are some devices that can make multi-platform households play nice together. The Boscheng Wireless Display Receiver is a perfect example. 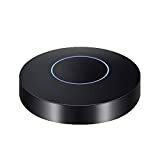 With one $25 box, you can wirelessly stream videos and music from any iPhone, iPad, or Android device. That’s right, it’s a single affordable box that supports Apple AirPlay and streaming from Android devices. Easy to use: Plug and play, no need download any software driver or APP for this TV adapter, 3 steps to enjoy yourself on large screen. Compatible with IOS 8.0 and above ( Such as iPhone 8 X 5 5S 6 6S SE 7 7plus, iPad Air, iPad Mini, iPAD Pro) and Samsung Android device 4.4 and above ( Samsung S3~S6, Note 3-7). Please double check whether your phone’s version is compatible before you purchase. Due to the copyright protection (HDCP), public sharing of the contents on the screen may be prohibited by some video service providers (such as Netflix, Amazon video, HULU and other websites). Also Works with iOS 11. Enjoy large screen with high picture quality: The WiFi display dongle up to 1080p full HD that perfect for E-learning, business meeting, family party and teaching (PowerPoint, Excel, Word, PDF, videos, movies and pictures from the iOS & Android smartphone, tablet to HDTV or beamer, projector). With HDMI and AV output, breathing lighting effects. Full HD 1080P output with faster processing speed offers you a perfect home theater experience.